(CNN) -- Heavy rain that began pounding California on Tuesday threatened to unleash dangerous floods and mudslides, especially in areas ravaged by wildfires. 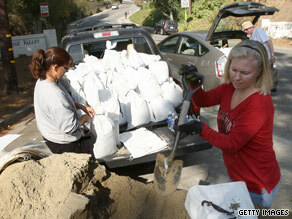 Residents of La Canada Flintridge, California, fill sandbags to prepare heavy rains in the fire-affected area. "Very heavy rain is likely over the Sierra Nevada and foothills from later today through Wednesday morning as a strong and very moist Pacific storm moves into the region," the National Weather Service said. Up to 8 inches of rain could fall in areas above 4,000 feet, it said. Forecasters described it as the first major storm of the season. The Santa Cruz County Office of Emergency Services issued a mandatory evacuation order for 60 homes in a section of Davenport, an unincorporated community north of Santa Cruz along the state's central coast. The San Lorenzo Valley high school, middle school, and elementary schools are closed, the county said. Many roads were flooding in Santa Cruz County, emergency management officials said. The area burned in the summer's Lockheed fire, increasing the chances of mudslides in the current storm. Wind gusts above 50 mph were reported from automated observation sites at high elevations, and rainfall was heavy over the Santa Cruz Mountains, the weather service said. Gusty winds were reported in the San Francisco Bay Area, but heavy rain there was expected to end by early evening. "Although it has been very dry for a lengthy period of time, excessive amounts of rain of this magnitude may produce flooding in locations that normally do not flood during an early autumn rainfall," the weather service said. California's Emergency Management Agency was conducting conference calls with the National Weather Service to stay abreast of the latest reports, spokesman Greg Renick said. The agency had advised other agencies to make emergency preparations, he said. Sandbags have been positioned at vulnerable locations. "We have activated the state Operations Center in Sacramento and also activated the centers in Los Alamitos and Oakland," Renick said. One major area of concern is the land burned by the Station wildfire in August and September, forecasters said. That 160,000-acre fire destroyed about 80 homes in Los Angeles County. "The heavy rain will create favorable conditions for mud and rock slides over burn scars," said the weather service, which issued numerous flood watches and warnings. Forecasters said debris flows also were possible in or near areas burned by blazes such as the Big Meadows Fire in Yosemite National Park, the Power Fire in Tulare County and the fire in San Bernardino National Forest.